Breaking the cycle of destitution that Haiti appears to be perpetually trapped in will be no easy task. Even if the political will of the international community takes on a more benevolent attitude than has historically been the case, the obstacles are deep-rooted. With the outcome of the recent general election still undecided, few people hold hope that the result will produce any kind of substantial break from this cycle – whoever wins. Externally, despite over $10 billion being pledged to Haiti to assist in the earthquake reconstruction effort, only a small percentage of the money has actually been released, with the weakness of the Haitian state commonly being asserted as the reason why. For years, the US, France and Canada have helped undermine democratically elected presidents, as well as prop up undemocratically elected ones, leaving a Haitian state with little resilience or power. Further dented by the earthquake, 17 per cent of civil servants are estimated to have been killed on 12 January 2010 and, in addition, the earthquake ripped right through the heart of Haiti’s political district, leaving both the parliament building and much administrative infrastructure in ruins. For any long-term change to transpire, it’s clear that Haiti needs political reconstruction as much as physical reconstruction, but the question is, how? Many in the international donor community have begun to focus on state-building as the long-term goal in Haiti, but is reforming Haitian governance from the top-down going to realistically provide a long-term solution? The US think-tank the Rand Corporation recently published a paper on Building a more resilient Haitian state, mapping out a blueprint for how the apparatus of the Haitian state should be strengthened. With much of the focus on creating alluring conditions for export-led economic growth, the report goes beyond governance recommendations to include specific economic policy. Taking much of its logic from the Interim Commission for the Reconstruction of Haiti (IHRC), the report reads more like a business-as-usual approach to Haiti, further undermining the strength of the state by suggesting that the provision of public goods should be primarily the domain of private providers and taking economic growth as the be-all-and-end-all. International organizations must engage and harbour an equal and supportive relationship with local organizations if they are to help foster the conditions for the state-society relationship Haiti desperately needs as a foundation for an effective state. By first recognizing, and then building on, existing Haitian social and democratic foundations, some kind of social contract may, albeit slowly, emerge. For too long, Haitian people have been excluded from political and civil processes of their own country, and as long as this continues, Haiti’s structural problems will continue. It’s clear that the current political class of Haiti does not have a democratic base and that a new generation must be nurtured. Civil society organizations have long been an important part of Haiti’s social infrastructure and if a strong democracy is to develop then their role will be crucial. If non-Haitians are to contribute to Haiti’s future constructively, then grass-roots support has to be a central part of it. The Lambi Fund of Haiti offers just such a model of the kind of community initiative that should be brought into the process. Founded in 1994 by both Haitians and Americans, The Lambi Fund was set up to strengthen civil society in Haiti by supporting already-existing peasant and women’s initiatives in need of financial or other resource-based support. With an emphasis on justice, democracy and sustainability, the Lambi Fund respects the notion that the Haitian people best understand what is required for Haiti to develop sustainably and so acts purely in a supportive capacity, avoiding interference with policy procedure altogether. 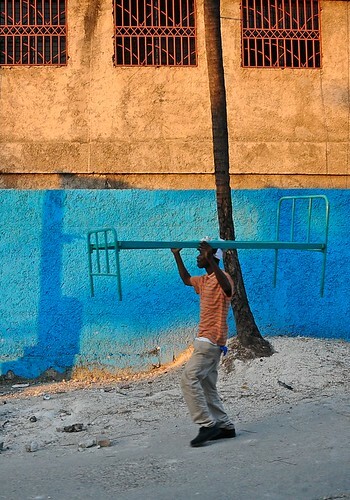 To overturn long-term structural trends that have afflicted Haiti, change must come via cultural foundations. Top-down state-building initiatives won’t foster the vision of a new generation without Haitians being able to forge their own path. Strengthening the police force or reforming the judiciary may provide some stability, but these kinds of measures will only help stop the brain-drain or bring about real democratic participation if Haitians are given the independence to carve their own future. Learning by doing is a paramount part of state-building, even if it means doing things differently. Would Scottish independence be good for radical politics? Read what writer and activist Adam Ramsay and professor and author Jim Gallagher think - then join the debate. Are riots good for democracy? Professor and author Stephen D’Arcy and historian and journalist Vijay Prashad go head to head. Are we sleepwalking into a fascist Europe – again? But the parties that have capitalized on insecurity face strong opposition from the majority of voters, argues Adam Bott. Eastern European migrants in Britain are fielding candidates to keep out the xenophobes, reports Ylenia Gostoli. Three Ukrainians living in Britain respond to recent events in their homeland. It’s like asking whether you should beat your wife weekly or daily, complains Kate Smurthwaite. What happened to unity in diversity? Mari Marcel Thekaekara is concerned about attempts to dismantle secular India.